Never experience the angst of "what to charge" for a particular online writing job. This handy, 4-step guide shows you how to quickly and easily set your freelance writing rates - without fear of overpricing or underpricing them. 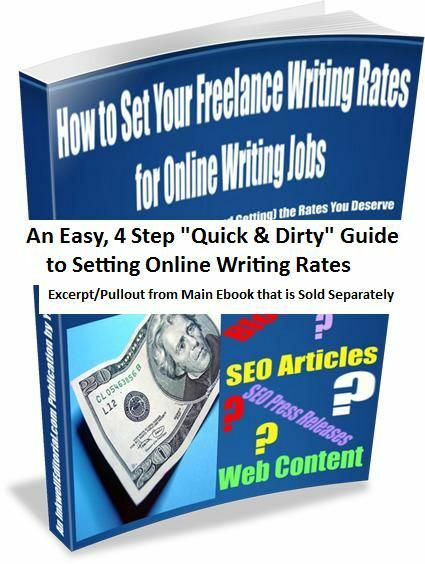 The is an excerpt (a pullout) from the ebook, How to Set Your Freelance Writing Rates for Online Writing Jobs: A Definitive Guide to Setting (and Getting) the Rates You Deserve, which can be found here (you'll also see the Table of Contents for the unabridged version of this ebook here). I decided to write this ebook for two reasons: (i) because questions about rates for things like blogging and SEO content writing are questions I receive all the time; and (ii) because both of these are relatively new freelance writing niches where information on rates is scattered at best. I’ve been a freelance writer since 1993, and have specialized in digital (online/SEO) content since 2007. My name is Yuwanda Black. I started out in publishing in New York City in 1987, working for one of the largest legal publishing firms in the world. I’ve been on both sides of the hiring desk. I owned Inkwell Editorial, an editorial staffing firm in New York, from 1996-2004. All of the information dispensed within is based on my years as a freelance writer – as someone who’s hired hundreds of freelancers, and as professional who has been hired by all types of firms, from small one-person startups, to Fortune 500 companies. Following is a complete table of contents. You’ll have all the info you need to properly set your freelance and online writing rates – for everything from blogging jobs to SEO web content. You can learn more about me at InkwellEditorial.com/about.